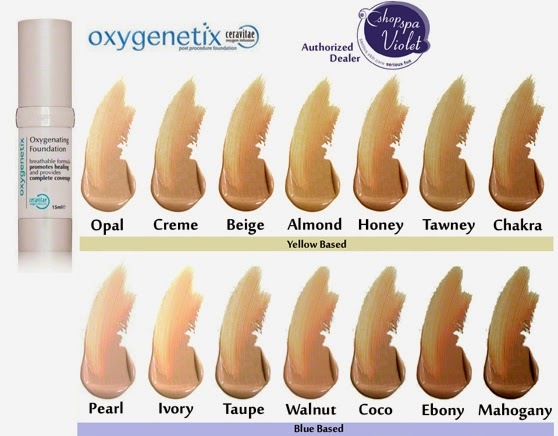 shopspaViolet is Serious Skin Care, Serious Fun: shopspaViolet now carries all COLORS of Oxygenetix! shopspaViolet now carries all COLORS of Oxygenetix! Breathable Foundation the Heals the Skin! shopspaViolet now carries the full color line of Oxygenetix. Well known as The breathable foundation that heals and conceals with SPF 25 and water resistant up to 90 minutes. Blendable shades that heal connective tissue, build collagen layers and conceals rosacea, eczema, wounds, acne and psoriasis. Models and entertainers know the benefit for how sheer it goes on and stays on under hot lights. If you burn easily, you tend to be blue based. If you tan well, you will be on the yellow based range. You may change shades throughout the year as you tan in the summer, our black Irish Miss Violet is finding Tawney superb in July.